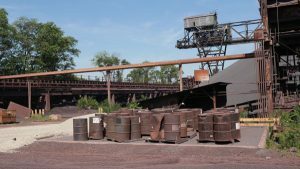 A group of investors purchased a South Carolina steel mill and wanted to bring it back into commission after being shut down for four years. FieldForce provided skilled workers including: precision millwrights, certified combo pipe welders, pipe fitters and electricians to the mill in a matter of days. This team supplemented other contractors’ workforce and performed all troubleshooting and repairs necessary for the mill to start functioning. A FieldForce crew also painted many buildings and other portions of the facility to enhance the overall appearance of the plant. FieldForce effectively repaired and replaced piping, pumps, motors and other important components needed to start production. The team alleviated potential safety hazards by employing workers with previous steel-mill experience. FieldForce also attended safety stand-down meetings at least once a week. All conveyors for the mill’s alloy system were operational within three weeks instead of the expected four. A positive attitude and attention to detail have helped FieldForce establish an excellent rapport with the managers and administrators at the steel mill. FieldForce expects to assist in running and maintaining the facility for the foreseeable future.